This tour hits 3 destinations in the central part of Los Angeles including Downtown and Central LA. and lasts four to five hours where you will see, smell, and taste fresh beer. The entire outing takes approximately 4.5 hours and includes a flight of four beer tasters at each location, bottled water, an expert beer guide, and as much craft beer information as you like. After boarding a comfortable 15-passenger shuttle, you'll be taken to three of the best craft breweries in Los Angeles. 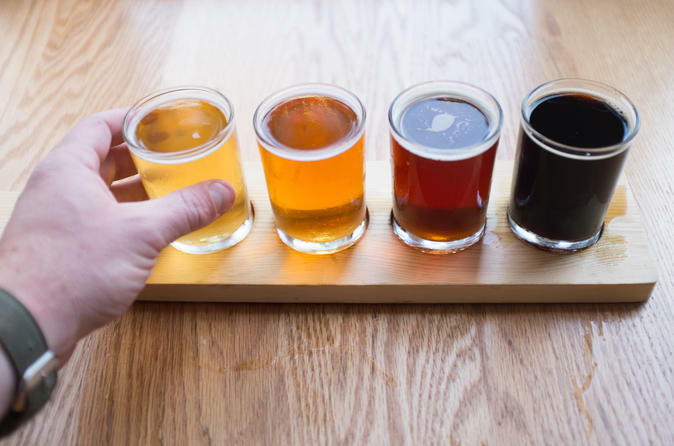 At each destination, you'll be served a flight of four beer tasters while your personal beer guide gives you an expert overview of what it takes to make delicious craft beer. The beer guides are eager to explain what goes into beer, why it tastes so good and why you should drink it every day of your life. You'll stay around an hour at each of the stops and at one destination. You'll get to go behind the scenes and see the inner workings of a fully functional craft brewery. For hungry guests, one of our stops has a full restaurant, so you'll have the option to purchase a full meal during the tour.